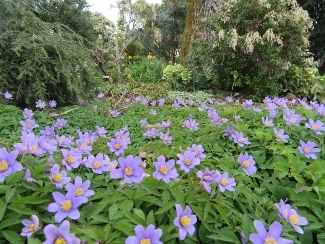 Joy Creek Photo Archive (c) all rights reserved For those who do not like white in the garden, Anemone nemerosa 'Robinsoniana' is a blue flowered selection which is a pleasing choice for a woodland or meadow garden. This is rhizomatous and naturalizes readily going dormant after bloom. The foliage is well-divided and frilly. The flowers are single and lavender blue.